Bart Gazzola of 103.7FM CFBU's Niagara Voices and Views interviews panel moderator Prof. Sharilyn Ingram. 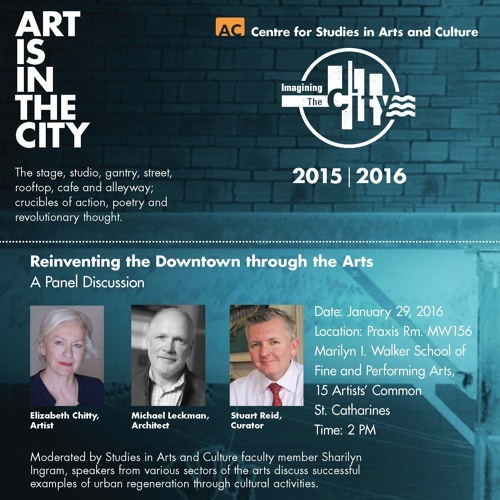 This panel discussion will feature artist Elizabeth Chitty, architect Michael Leckman, and curator Stuart Reid, and will take place this Friday, January 29, 2016 in Praxis Room MW156 at the Marilyn I. Walker School of Fine and Performing Arts, Brock University in Downtown St. Catharines. Niagara Voices & Views focuses on issues relevant to Niagara, including perspectives from residents whose voices are often underrepresented in main media. Running Wednesdays at 4 pm EST, Niagara Voices & Views is just one of the many intellectual, articulate and entertaining programs on offer from CFBU 103.7 in St. Catharines.